Make it look and feel like a spa. That was the direction given to us, for the fourth floor patient care addition, by the CEO and the CFO of St Tammany Parish Hospital. That direction was music to our ears and allowed us to use our imagination and creativity. We also knew that it would take more than that direction to make a great facility. 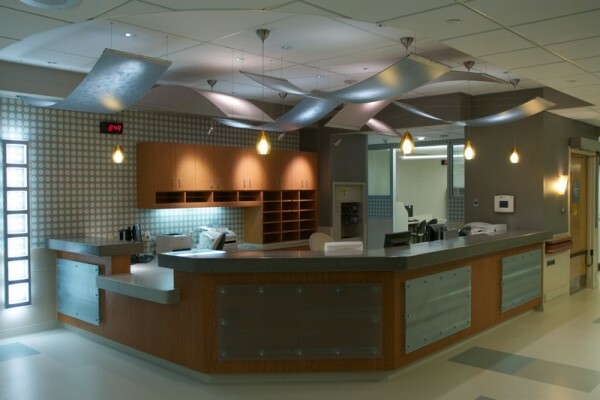 We started with the spa feel, where you first enter the space, at the nurses station utilizing pendant lights over the counter and accent lights on the cabinets, giving it a rich spa look and still able to illuminate the work area and the contents within the cabinet. We finished it by softly illuminating the wings over the nurse’s station, from above, with spots of lights and a light ladder to the side for an interesting finish to the space. We placed sconces in the corridor, illuminated scenery above the bed and sconces in the family area. We enjoy all of the complements that we receive from guests that have stayed in the facility. The second part of a successful facility equation is patient comfort. The patient has total control of the wall-mounted fixture above their bed as well as downlights around their bed. The corridor lighting is in a cove on the patient room side of the corridor, with a solid wall for 18” from the ceiling, which eliminates all spill light into the patient room from the corridor. The patient rooms are able to be used as ICU rooms as well and have a nurse’s station between each of two rooms. The lighting for work surface of the nurse’s station comes from dimmable LED fixtures mounted under a shelf 6” above the work surface. This form of lighting eliminates reflection off of the nurse’s face through the window for patient comfort. We finished off the rooms with dimmable sconces in the family area with a color of glass that would not disturb the patient if the family wanted to read while the patient slept. The third part of a successful facility equation is the design around the circadian cycle. You will note three different lighting levels in the three corridor pictures. The first level of lighting reflects the morning and daytime with the cove lighting and the sconces illuminated. By the flip of a switch the cove lighting can be easily and evenly decreased by half. The second level of lighting reflects the evening and is accomplished by turning the cove lighting off. That automatically illuminates the low-level step lights but leaves the sconces illuminated. The last level of lighting reflects sleep time and is achieved by switching off the sconces leaving the step lights, with micro prism lenses directing the light down, to do the lighting. The nurses can navigate the corridors in safety, have plenty of light at the ICU nurse’s stations and there is no intrusive light in the patient room. In order to accomplish a great design it is always necessary to great team consisting of the architect, owner, engineer and lighting consultant. Working together the outcome will reflect their vision and please the patients that will be served.